This colorful view of Mercury was produced by using images from the color base map imaging campaign during MESSENGER's primary mission. These colors are not what Mercury would look like to the human eye, but rather the colors enhance the chemical, mineralogical, and physical differences between the rocks that make up Mercury's surface. Image released Feb 18, 2013. A new video by a NASA spacecraft orbiting Mercury is showing the closest planet to the sun like never before, revealing the rocky world as an oddly colorful planet. Scientists created the new video of Mercury from space using images captured by NASA's Messenger spacecraft, which has been studying the small planet from orbit since 2011. The video shows a complete global map of Mercury as it spins on its axis and was assembled using thousands of photos into a single view. "This view captures both compositional differences and differences in how long materials have been exposed at Mercury's surface," Messenger mission scientists at the Johns Hopkins University Applied Physics Laboratory in Laurel, Md., explained in an image description. The laboratory oversees the Messenger mission for NASA. "Young crater rays, arrayed radially around fresh impact craters, appear light blue or white." The colors of Mercury in the new video are actually enhanced to better differentiate between the different kinds of terrain on the planet, the researchers said. Altogether, the video shows 99 percent of the surface of Mercury with a resolution of about 1 kilometer per pixel. 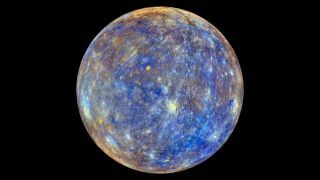 "Medium- and dark-blue areas are a geologic unit of Mercury's crust known as the 'low-reflectance material,' thought to be rich in a dark, opaque mineral," Messenger scientists wrote. "Tan areas are plains formed by eruption of highly fluid lavas." NASA's Messenger spacecraft (the name is short for the MErcury Surface, Space ENvironment, GEochemistry and Ranging) launched in 2004 and became the first spacecraft ever to orbit Mercury when it arrived at the planet in March 2011. The spacecraft's $446 million primary mission ended in 2012, and it is nearing the end of its first one-year mission extension. During its two years orbiting Mercury, the Messenger spacecraft is expected to snap more than 168,000 photos of the planet, mission managers said.